And then it hit me like a ton of bricks. Without barely being aware of it, I was hanging on to so much anger and resentment. I felt cheated. Admitting this to myself and saying this out loud feels so wrong, because I birthed four healthy babies and the miracle of that is not lost on me. But my healing can only come from being honest, even when it feels ridiculous. No matter what I do to lose weight, I feel like I end up right back where I started. A perfect Whole30 followed by the exact same habits, followed by some more self-loathing. I was stuck in a vicious cycle where some really deep emotional baggage wasn’t being addressed. Are you stuck in a cycle of self-sabatoge? Growing up, almost every part of my identity was tied to my body. I was an athlete. I felt strong. Within a matter of nine months, I permanently lost all of that. My stomach stretched so big the hanging skin would never go back and draped just perfectly over my c-section scar. My stomach muscles separated and remains separated. I beat myself up trying to put myself back together. I was literally in the gym 6 weeks postpartum killing myself eating 1200 calories a day, trying to drop the baby weight, and nothing was changing. So I gave up on myself, until I couldn’t take it anymore and then I punished myself again. I had found myself in a constant cycle of punishment, disappointment and self-sabotage. My body didn’t just look foreign, it didn’t work. I felt completely let down and ridiculous for being so vain. It is very difficult to love and nourish something you are, at best ignoring, at worse angry and disappointed in. What I needed was sleep and love and nourishment. What I needed to give myself was kindness and grace. Where in your life do you need to acknowledge negative feelings and offer yourself some grace and kindness? I was 25 and felt like I was ruined. I would joke with my husband, “you can’t leave me until you pay for my tummy tuck”. But behind that joke was so much hate and disgust. And then more disgust at my ungratefulness that I had a healthy baby. Meanwhile, everywhere I looked woman were “bouncing back”, they would drop the baby weight quickly and look like themselves. Everything told me that what I was feeling and what I was going through was not normal. Have you ever felt that way? And then I did it three more times. I grew three more perfect babies. Literally miracles. I also had three more c-sections, nursed for three more years and despite loving being a mom, like my one true calling in life, deep down I was not addressing some very real feelings. Lasting change is not made through hate, force and negativity. Nothing grows there. Lasting change is made through grace, compassion and love. All things I realized I needed to cultivate for myself. Just let that sink in for a minute. I let it sink in and I realized that this thing that feels so big and heavy is not my burden, it is my gift. By sharing it, by unpacking it and living in it, I will not only change my life, but I will help other woman do the same. That is literally my purpose, to lift others up and show them their worth. To help them find love and joy. I do it day in and day out as a mother. I did it as a teacher. It is the entire reason I started this blog. It is the essence of who I am on social media. It is why I share essential oils and lead such an extraordinary team of woman. It is my purpose. 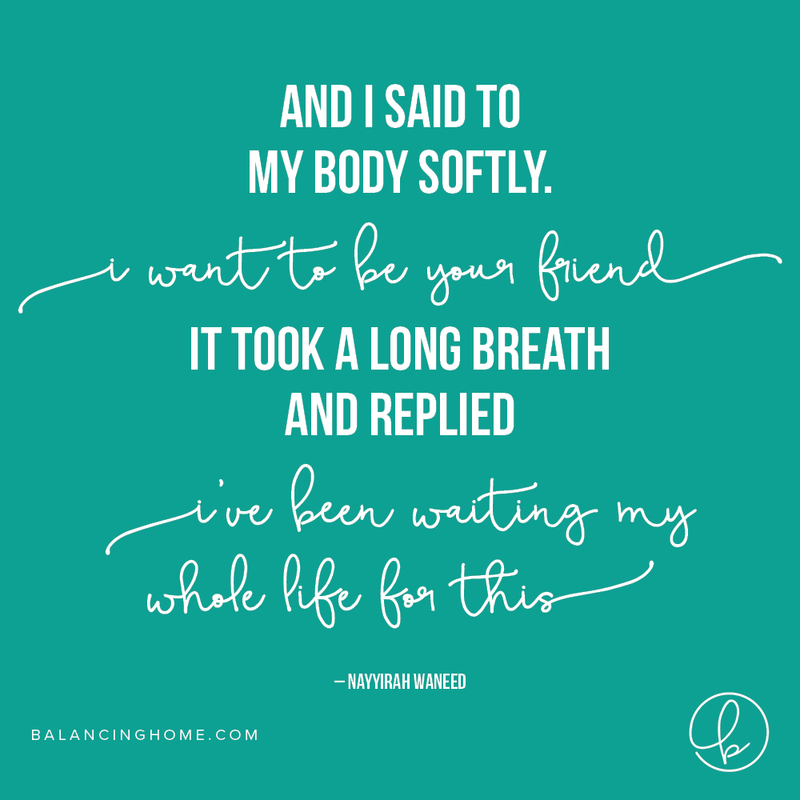 If you are angry at your body for letting you down, I want you to know you are not alone. If you are having a hard time seeing how life is happening for you, I hope this post will give you a chance to reflect and shift your mindset. If you know a momma or a friend who needs this message, please pass it along. PS- This is my favorite self-love post-partum program that helps you drop the baby weight and heal your core.